It should always be possible to rollback an update (files, database, IIS-settings, etc.). Rollback should also be fully automated. I am very happy to say that we have fulfilled all our above goals, let me tell you have we did it. 4. If the unit tests are successful the TeamCity creates a deploy package. The package contains a MSDeploy zip file, configuration files and our deploy tool chain (Powershell scripts and a few executables) – everything you need to deploy the site. Scripts – contains various scripts needed to perform deployment, the most important being Deploy.ps1 and Deploy-Local.ps1. The settings.xml is the base of all non-episerver settings. It contains connection strings to databases, paths to where the web site should be installed, where logs should be placed, where VPP files are placed, integration settings to external systems and much more. In each environment specific directory, such as “AT” it is possible to override these settings by creating a settings.xml. The new settings.xml does not replace the one in the parent directory, it is merged with it and the environment specific file takes precedence over the general. We use this for both development and deployment. When a developer checks out the source code, there is a “Init.ps1” script in the Scripts folder (not included in the release package). This script will setup the website according to the specified settings (in my case the Dev-PM folder). The script configures the local IIS server, creates app pools, creates the sites, sets permissions on folders, creates local MSMQ queues, configures NServiceBus and so on. Thanks to this script all the developers have a development environment that is nearly identical! Super sweet! Ok, back to deployment. As you might have figured out, the episerver-config.master.xml serves as base for all episerver sites. Since this is an enterprise installation we can have several sites and each –siteX represents such a site. All the settings in the files are overridable in the same way as with settings.xml. We use this to, for example, provide the appropriate license file for the specific environment. 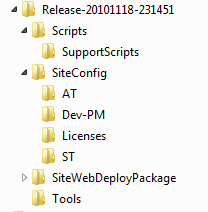 This might be the least exciting directory, it simply contains a MS WebDeploy package created by MSBuild. This package contains everything needed to run the sites, except for the site specific configuration files that Deploy.ps1/Deploy-Local.ps1 will put in place. This directory contains our “deploy tool chain”. The tool chain includes, MSDeploy.exe (WebDeploy), SimpleScriptRunner.exe (DB migration), 7za.exe (zip) and a bunch of other tools needed to setup and install Msmq and NserviceBus. When we started implementing the automated deployment we were hoping to be able to do most of the heavy lifting in WebDeploy. But after a lot of research and testing we came to the conslusion that it was probably possible to do what we wanted to do in WebDeploy (WebDeploy is very powerfull), but we could not figure out how. The WebDeploy documentation at that time was almost non-existent and had few advanced examples. Instead we made the decision to use PowerShell for most of the work and use WebDeploy only as a method to package transfer files. 7. Remotes to the webserver and runs Deploy-Local.ps1. The script installs the files, configures IIS, copies license files, etc. 9. Print result and exit! If the update of some reason is not working as it should, the update can be easily rolled back by executing “Deploy.ps1 <environment> -Rollback”. This will restore all affected system to exactly the same point as they were before the update. Automating the build and the deployment process is absolutly worth the effort it takes to implement it. By automating the process we have been able to catch more bugs, develop and release faster and at the same time make the entire process less dependent on certain people in the group – our knowledge is documented in the build and deployment scripts. A very nice bonus from this is that we can version control everything related to the site, IIS settings, EPiServer settings, EPiServer Licenses and much more. Also, installing the release on a “empty” server is as easy as updating an existing installation. Microsoft WebDeploy – Deployment tool from Microsoft. Psake– Build automation tool written in PowerShell (inspired by rake in Ruby). SimpleScriptRunner – Tool to run a directory of numbered sql scripts against an MSSQL database. OpenDBDiff – Tool/library to generate SQL-diff scripts. One way to handle license files for devs which is one of the few things I think Bartek’s solution didn’t handle is to have separate directories for each computer from which a build script copies from. Very nice explanation. I am newbie at EpiServer world, and now have task to build CI process for it. Code deliveries are easily performed, but have you ever thought on content deliveries? E.g., some example content from development environment to QA and UAT? While it’s a great post, the design of EPiServer itself screams of ego. I’m sorry, Umbraco can web deploy itself without installation and without all that loose file dependency. EPiServer needs to do a lot better. Great great work from you guys tho. Thanks all the same.